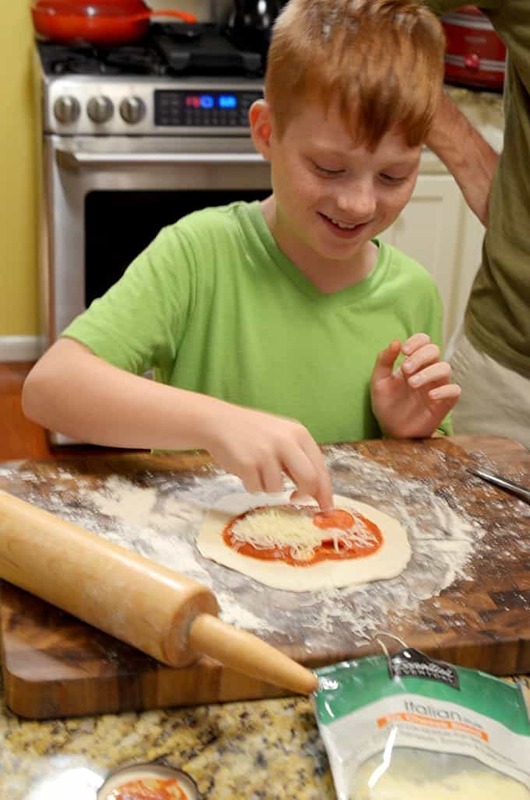 Easy Calzones using store-bought biscuit dough are a fun and delicious activity to help get your kids in the kitchen. As an added benefit, this also happens to be a fast and delicious family meal. 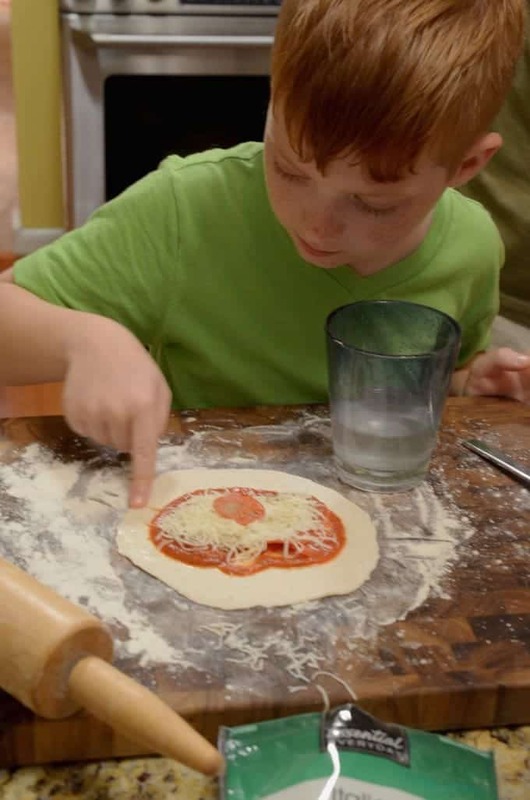 The Platter Talk Kids are at it again, this time with some fun and easy calzones that also happen to be delicious! We love having our kids help out in the kitchen. 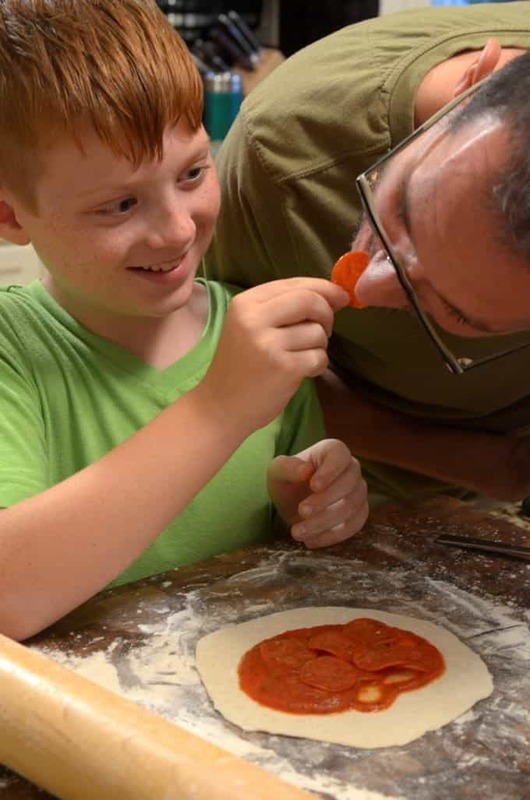 It’s a great opportunity to spend time with them and provide them with some important life skills that they can pass on to kids of their own some day.We also love all things Italian, including a similar recipe we showed you how to make some time ago, Calzones Anyone Can Make. Roll out a portion of canned biscuit dough. Spread pizza sauce on the rolled out dough. Add pepperoni, shredded cheese, and pizza flavoring. Using your finger tip, wet all edges of the dough with water. Fold over, crimp edges with a fork, and tuck crimped edges under the calzone. Bake at 375℉ for 15-20 minutes. Dip in some marinara sauce. Have a big delicious bite. 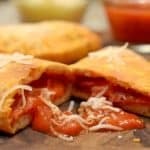 Store bought biscuit dough makes these Calzones easy and fun to make. 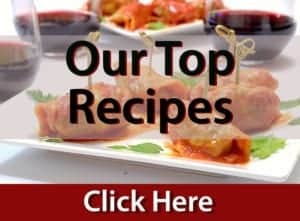 This recipe truly can be prepped and prepared by the kids with very little supervision. 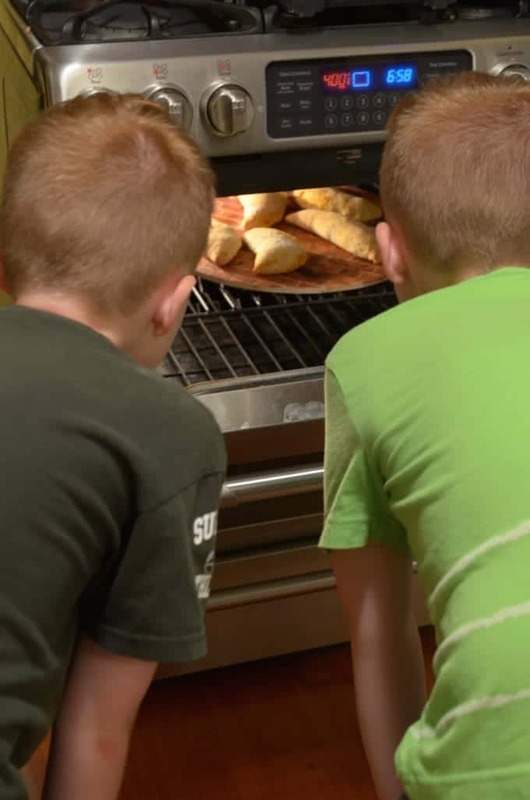 However, depending on how old your kids are, they may need help getting the calzones in and out of the oven. Each biscuit, once rolled out, is the perfect individual portion and once baked they stay soft and delicious. It is great for anyone that may think that pizza dough is too chewy or tough. Our kids are purists. They treat calzones just like pizza. They are happy with simple fillings like cheese and pepperoni. However, you can fill them with anything your heart desires. It’s amazing how quickly the process went. In no time the kids had transformed all of the biscuits and turned them into calzones. 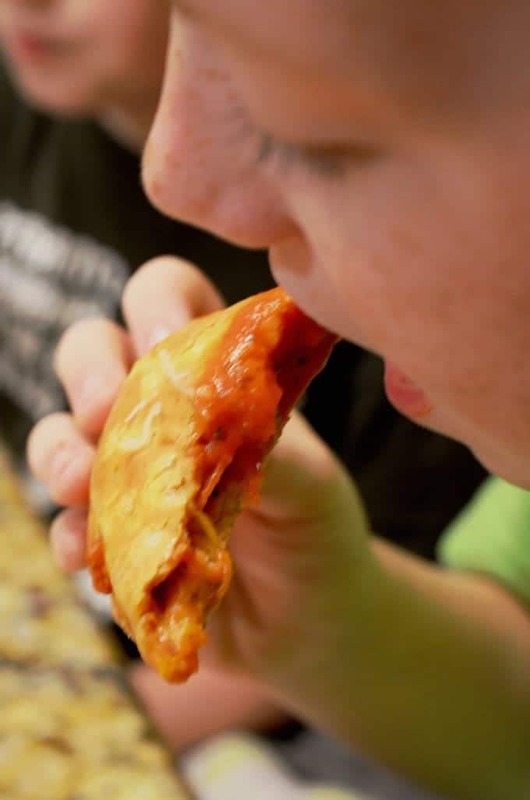 No one complained because everyone was able to fill their Easy Calzone with what they wanted and liked. 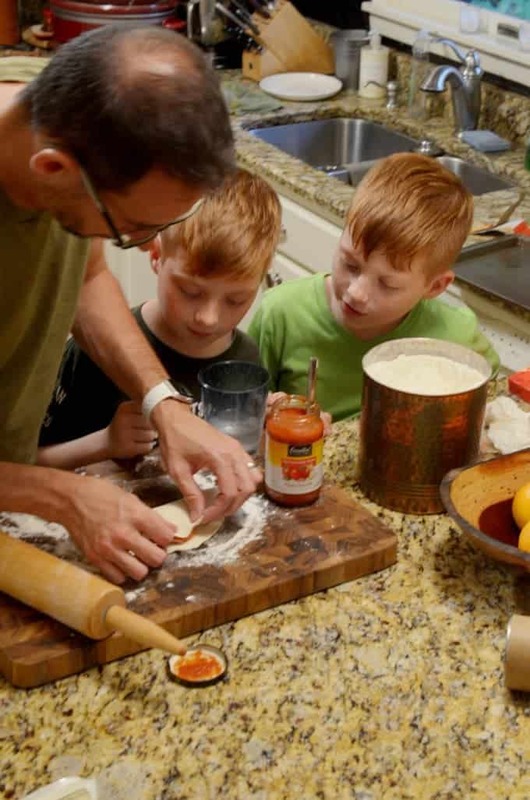 Perhaps the most important step to making these Easy Calzones is to remember to have a good time and of course, taste the love. 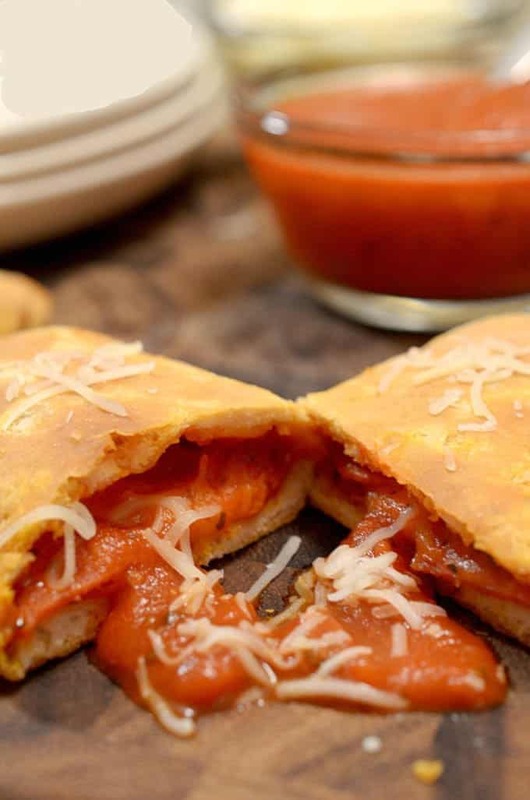 Try these Easy Calzones soon and tailor them with the ingredients you love! Easy enough for a kid to make and delicious enough for the whole family to enjoy! Fillings such as pepperoni , cooked sausage, green peppers, onions, etc. On a floured surface, using a floured rolling pin, roll out each biscuit to a thickness of around 1/4 inch. 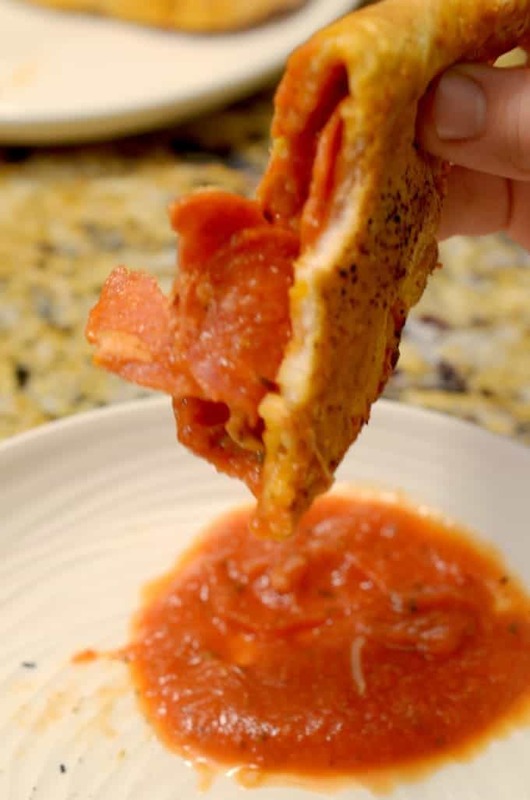 Place a spoonful of pizza sauce on the rolled out dough, staying away from all the edges. Fill center of the calzone with filling of choice. Using a little water dampen your finger. Take your dampened finger and wet all edges of the dough. This will help seal your dough together. Fold your dough over to form a half circle. Using a fork, crimp the edges to assure that the calzone is sealed. You could also use your fingers. Place on a ungreased cookie sheet or pizza stone in your over. Cook until calzones are golden brown approximately 13-15 minutes. I LOVE Calzone, much more than pizzas and these look absolutely delicious! 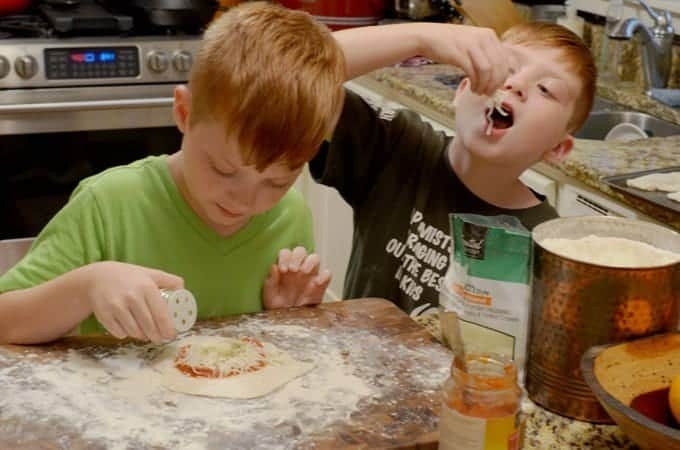 I can just imagine how much fun the kids had making these calzones! Definitely family time! Lovely to get children involved in cooking, and this seems like a perfect kind of recipe. This is such a genius use for biscuit dough! Thanks, Paul. The boys certainly thought it was a good idea! 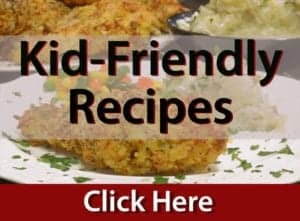 Love recipes where kids can get involved. Got two boys so I’m always looking for ideas to bring them to the kitchen to help out. Great recipe BTW. What a fun idea for when my nephews come to visit! These cute little calzones look tasty. It looks like the kids had a great time making these beauties. That is wonderful meal when kids involved it is always fun. Something to make when I see my nieces next!! thx! 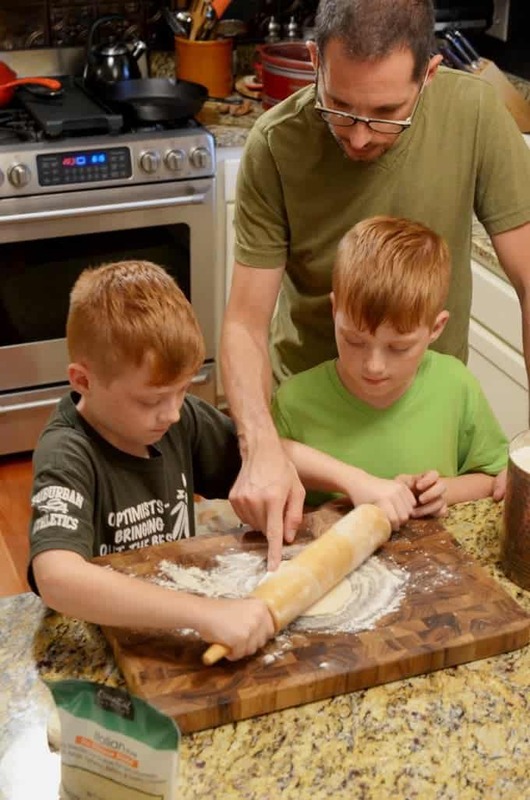 I always loved cooking with my kids too! Now I have to wait until my granddaughter comes over to help me in the kitchen-it’s fun to get the next generation involved too! We’ll have to try these one of these days! Wow so clever never would have thought to transform biscuit dough into calzones!! And I love me some calzones 🙂 can’t wait to try! I love this! 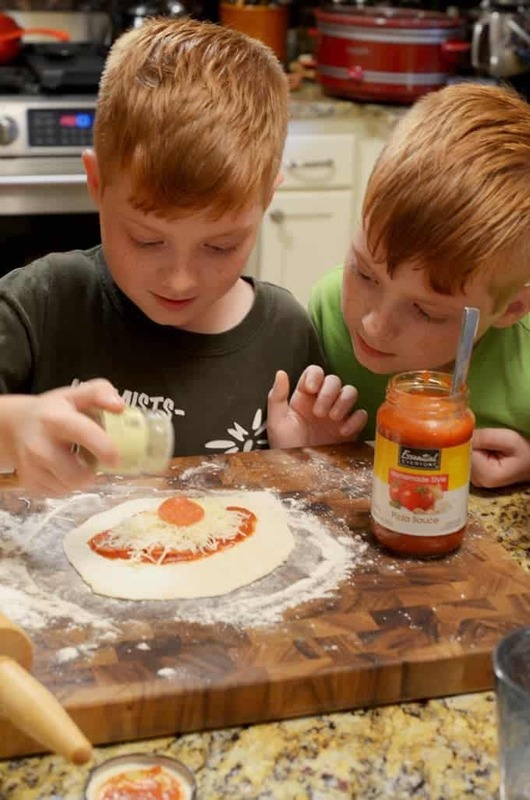 What a fun way to get the kiddos to cook! This is so easy. Kids will be able to do most of it themselves. You children are adorable! How brilliant to use store-bought biscuit dough to make calzones! Never thought to do that! Brilliant! 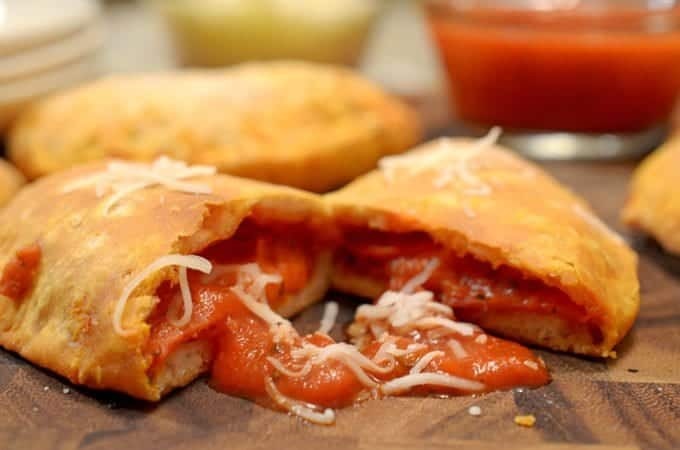 We love making calzones, as there is so much that you can do with them. These look delicious, and it looks like the kids loved them too! So cute that you’ve got your kids cooking with you! Mine is all grown up and I think she’s cooking averse. I love all the pictures with your kids. It looks like you all are having fun! The key to getting kids to help in the kitchen, right? 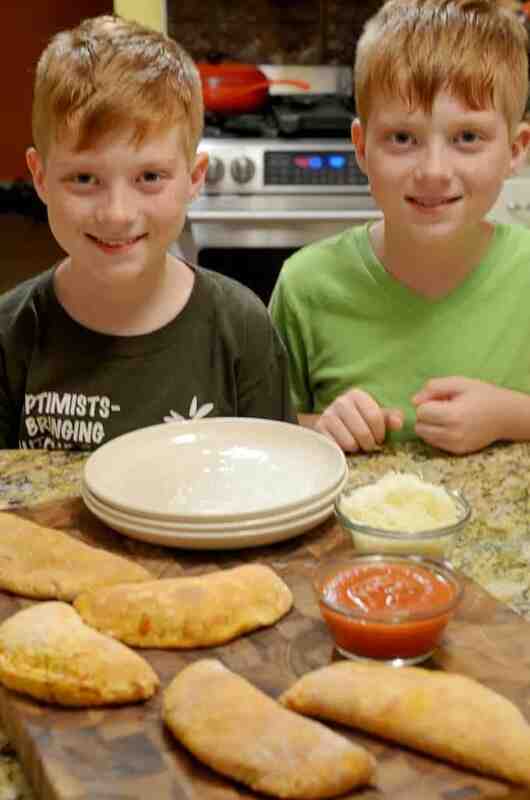 The calzones sound delicious and I think my kids would love them! Love that you got your kids involved. this looks like a meal kids are sure to love.